Natural and human-induced groundwater dynamics in hyper-arid aquifers play a crucial role in the evolution of the landscape. The area overlying the Saq Aquifer, in particular the Al-Qassim area within the central part of the Kingdom of Saudi Arabia, has witnessed numerous land deformation (land subsidence and fissures) events throughout the last two decades. An integrated remote sensing and hydrogeologic approach is adapted to identify areas affected by the land deformation and also to better understand the role of human-induced groundwater dynamics in the formation of these deformation features. A fourfold approach was implemented including: (1) conducting field surveys to collect observations and validate the reported deformation features, (2) applying a spatial correlation in a GIS environment for the reported damaged locations together with surface and subsurface geological features and groundwater extraction. (3) extracting the subsidence rates using SBAS radar interferometric technique using ENVISAT data sets, and (4) correlating these subsidence rates spatially and temporally with GRACE mass variations data. The results show that high subsidence rates of − 5 to − 12 mm/year along a northwest–southeast direction coincident with areas witnessing a significant drawdown in the fossil groundwater levels (up to 150 m) and a depletion (−10.1 ± 1.2 mm/year) in GRACE-derived terrestrial water storage. Findings from the present study draw attention to the quick responses of landscapes to human-induced groundwater dynamics under hyper-arid conditions. 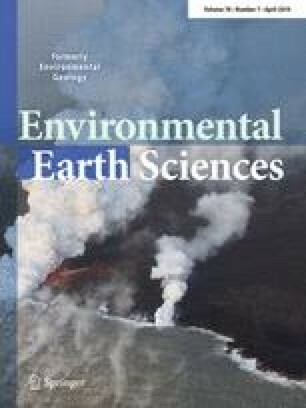 The authors would like to thank European Space Agency, Earth Sciences Remote Sensing Facility at Western Michigan University, Center for Space Research at the University of Texas at Austin, Saudi Geological Survey, and the Ministry of Environment, Water and Agriculture for their logistical, field, and data support, as well as we acknowledge the editor and reviewers of the Journal of Environmental Earth Sciences, for their instructive comments and suggestions.